Many fans of eco-holidays prefer resorts in Croatia. And this is not surprising. Croatia - one of the ecologically cleanest countries in Europe, which is in the top ten of many world rankings on the level of development of tourism infrastructure. Therefore, there is nothing surprising in the fact that properties in Croatia are in high demand among foreign buyers. Having a house on the sea in Croatia, you can not only enjoy the excellent beach holiday or yachting, which is very popular in the country, but also to restore strength and health on the local mineral springs. The length of the Croatian coast is nearly two thousand kilometers, and the number of islands in the country - more than a thousand, of which almost seventy - populated. 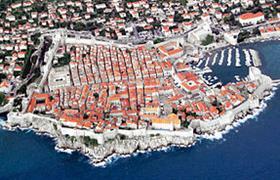 But the picturesque island of Hvar is in highest demand among buyers of real estate in Croatia. Namely on this island, the owners of houses, apartments and villas can luxuriate under the tender rays of the sun on the shore of the Adriatic Sea, all year round. In addition, the island of Hvar has also a sandy beach, which is a rarity for Croatia. Among the advantages of Croatia - not only favorable climate, beautiful nature and developed tourist industry. The undoubted advantage is that the local market is fully open to foreign buyers, and real estate prices are much lower than in some neighboring countries of the region. Additionally, you can buy realty at a low cost not only from the owner, but also from the builder. There is an active new construction in major cities and the world-famous seaside resorts in Croatia, so that everyone can make a simple and quick selection. For foreigners it is quite simple to buy a home in Croatia. The country's legislation allows non-residents to acquire real estate as both a legal person and an individual. In order to become an owner of a house, apartment or villa in that sunny and safe country for residence, you need to choose the most suitable to your requirements property, enter into a contract and to apply to the Ministry of Justice. After receiving a permit you should only obtain a document on the right to ownership from the land registry - and that is all!